The Memphis Tau Iota Sigma Alumni Chapter of Phi Beta Sigma Fraternity along with the Hobson-Goodlow Education Foundation is sponsoring the “Second Annual Mother Son Dance: A Queen and Her Prince” presented by The Memphis Sigma Beta Club. This event will be held in The Thomas Center on the campus of Christian Brothers University in Memphis on Saturday, April 27, 2019, at 6:30 pm. The National Sigma Beta Club is the youth entity of Phi Beta Sigma Fraternity. Sigma Beta Club offers unique opportunities to exemplify wholesome values, as well as social and cultural awareness to male youths at a most critical stage in their personal development. They feel one of the most important, yet unrecognized things we can offer to our club members and other young men in the Memphis area are opportunities to create memories with their families that they will cherish forever. This event is for mothers and sons of all ages. No one is too old or too young to come and enjoy themselves! They will pay homage to mothers and maternal influences as well as their sons, and those who they love as if they were their own sons. Their mission is to raise funds to support college bound members of the Memphis Sigma Beta Club. Tickets are $30.00 per Mother and Son and $10.00 per additional ticket (with $30.00 ticket purchase) and are available online at Eventbrite.com (https://sigma-beta-club-mother-son-dance-2019.eventbrite.com). You may also contact their event chairmen listed below or any member of The Tau Iota Sigma Alumni Chapter for tickets and further information about the event. Given the enthusiasm and feedback they have received from the community after their inaugural 2018 Mother Son Dance, they anticipate a sellout affair with over 300 men and boys of all ages and attending with their mothers, grandmothers, aunts, sisters, and others who have poured into their lives. In this regard, they would like to request the consideration of your organization and members purchasing an ad in the souvenir book ($100 full page) or a ticket sponsorship ($30.00) for a mother and son. They would also appreciate your participation as a sponsor through the contribution of a gift, gift certificate, or monetary donation ($25.00 value) that will be used as a raffle prize. Learn proven credit repair techniques that can help you improve your credit in the short and long-terms. Registration is required. Limited seating. So, you want to do business WITH Memphis and IN Memphis! To do this really well, you might need to understand and maximize community assets and resources. You also might need to know exactly where your customers are and what they look like! Do you know how to develop and maintain relationships of support? Come to Session #4 to uncover these necessary strategies and more! "Lucy Shaw is a best-selling author, facilitator, national speaker and Chairwoman of the Board of Tri-State Bank of Memphis. Her areas of expertise include leadership, the dynamics of poverty as well as business and personal development. Her experience covers over 30 years of experience as a C-Suite Executive, Banker, Entrepreneur/Consultant and Ministry." Lunch will be provided. Please RSVP by signing up here. This workshop series focuses on how to start your own creative business, grow your client base, and promote yourself without selling out or starving. Day 1 begins with a getting to know you session to identify the personal needs of each student, followed by an in depth workbook to calculate your yearly budget and then set your pricing (hourly and flat rate for your mosts commonly requested jobs). The second half of the day we will focus on how to successfully communicate value and process to your clients when pitching so you can land the job. It'll get super transparent as we share real quotes, numbers, and pitch decks we've sent to clients and walk you through making a proposal deck that will blow the socks off your client. Day 2 is all about self promotion and working towards landing your dream clients: we'll do exercises that help you position yourself, talk about yourself, and market yourself both online and offline. We'll conclude the day with a session that covers how to smoothly take a project from first email, to quote, to contract, to payment, to proofs and design, to completion. We'll go over all the tools we use day to day at Hoodzpah, including project management, bookkeeping, contracts, collaboration, and more. We'll create a business plan and cap the day off with tips for monitoring your financial health. Each session will include plenty of time for Q&A and our goal is to make the content as tailored to you as possible. As a current or future small business owner, you must learn how to best protect your creations and innovations. Without the proper protection in place, you may not reap the full benefits of your idea. Intellectual property protection is not only for large corporations, but is extremely important to protect entrepreneurs. Registration is required. Limited seating. Financial statements can be confusing, but are an important part of your business's financial picture. This workshop will help you: calculate current and future financial needs, figure out what you own/owe, and learn to base management decisions on all of the information. Registration is required. Limited seating. Emerging Leaders is a free, advanced, intensive program for small business owners and small business executives. FREE! - The only cost is your time and commitment over the 7 month curriculum! All other costs are covered by SBA and our partners. ARE YOU AN ART LOVER, ART ENTHUSIAST, ART COLLECTOR OR ARTIST YOURSELF? This major event is highlighting over 50+ artists and art vendors inside an AMAZING venue made for the arts. This event is happening inside the HISTORICOrpheum Theatre. The sponsors are proud to host events that support the arts, entrepreneurship, diversity and inclusion including young artists. Every small business owner has been told that they need to use social media, but are usually not sure what to do next. What social media platform works best for my industry? What time commitment will it take to keep up with all these social networks? How do I control what people may write on my social media pages? Come hear from social media experts what to do and what not to do when launching your social media strategy. Registration is required. Limit seating. Do you need to get your OSHA training completed? Join us for the OSHA 10 class! This is the OSHA 10-HR Construction Safety class. It will teach the recognition, avoidance, abatement, and prevention of safety and health hazards in construction workplaces. This course also provides information regarding workers’ rights, employer responsibilities, and how to file a complaint. The cost for non-members is $195. The cost for active MAMCA Members is $100; please check your email for the Member's discount code. The class will be held at the City of Memphis Business Development Center, 555 Beale St, Memphis, TN 38103. Join Director Joann Massey along with the Memphis Business Journal for our Bizwomen Mentoring Monday event. Director Massey will serve as a mentor. Attendees will get the opportunity to choose from 40+ of the most influential women in the community for one-on-one coaching sessions. If you’ve ever wondered whether a co-working space was right for you, now is your chance to try a complimentary day working with us. Registration not required. In Part II of Elevator Speech, you will have the opportunity to deliver your Elevator Speech in front of a panel of judges. 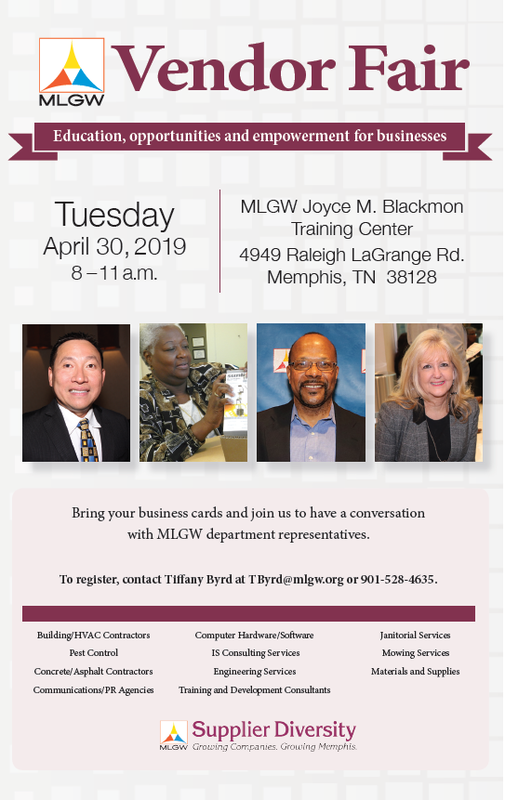 Judges includes representatives from the Small Business Administration, US Army Corps of Engineers, City of Memphis and Tennessee Small Business Development Center. Registration is required. Limited seating. What if you suddenly found yourself on an elevator with a contracting officer, an elected official, or some other a potential government customer. Can you quickly deliver what make you unique from you competitors? As a vendor or supplier you want to make a good first impression. Simply put, you need an Elevator Speech. An Elevator Speech is 120 seconds or less, that describes your expertise or that of your company. An Elevator Speech is as essential as a business card. A great opportunity to learn how to develop a new elevator speech for your business or improve and polish your existing one. Benefits to attendees: Develop your new and improved elevator speech; Understand how you can flexibly use this in different situations. Registration is required. Limited Seating. Tax time is coming up quickly and there have been significant changes to the laws! Join MAMCA to learn what you need to know before you file your taxes and make sure that your business is ready to file. A light lunch will be served at 11 AM. The class will be held February 12, 2019 from 11:30 AM to 1 PM at the City of Memphis Business Development Center, 555 Beale St, Memphis, TN 38103. Managing your business finances have to be addressed every day. Join us for a lunch and learn to hear more about this extensive accounting program, to learn about how you can make it work for your business, and start implementing it right away. The cost for the class is $25 per person. The class will be held at the City of Memphis Business Development Center,555 Beale St, Memphis, TN 38103. Breakfast and lunch will be served. As a client of the TSBDC, you have access to a plethora of free services and discounts! Free online training, marketing lists, small business research, professional-grade financial projection tools, and many more. You are even able to get discounts on popular email marketing and accounting tools. Come learn more about these free services and how to take advantage of them by the time you leave this workshop. Registration is required. Limit Seating. Our goal is to introduce to business owners the process of developing strategies and planning for products or services, advertising, promotions, branding and sales to reach the desired customer segment. BENNY: Marketing will employ tools from the economic and competitive strategies to analyze the industry context in the market. List of esteemed guest presenters coming soon! To be successful in winning government contracts, it is important for business owners to understand, articulate and write out their what, why and how regarding how to do business with the government. It includes defining metrics to measure progress in order to know where your are relative to their goal (and recalibrate as needed). This in-depth session is hands-on and designed for participants to have some practical next steps for growing their business by contracting with the Government. Participants who complete the session will: 1. Identify internal and external applications of strategic thinking and how they benefit their organization. 2. Understand their businesses' capabilities (SWOT: strengths, weaknesses, opportunities, and threats). 3. Identify their target customer and geographic area of focus. 4. Learn the steps to marketing to the federal government. 5. Develop a one-page strategic plan.